In the jungle parkour is absolutely needed, but what if you are just walking down the street? As quickly as parkour developed, there were some who looked around and noticed nobody was chasing them. In fact, nobody was ever going to chase them. And if there was no danger, why were they trying so hard to get away? It would be different if they were being followed by a lion or a police officer. But if there was no imminent danger, why not have a little fun. 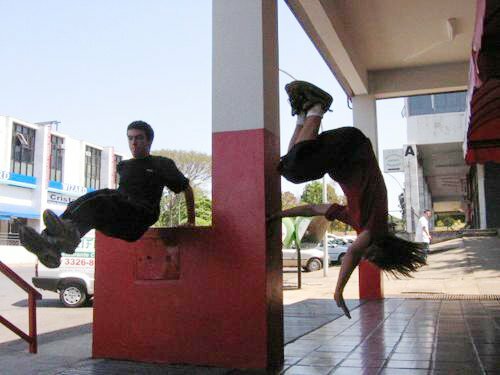 Soon a new discipline called freerunning started to appear. It grew out of parkour and the two share more similarities than differences. In fact what may separate the two isn’t the technique but a philosophy. A traceur (disciple of parkour) wants to get from Point A to Point B as quickly and efficiently as possible. A freerunner may start at Point A and who cares about B. A traceur will run down a sidewalk as quickly as possible. A freerunner is definitely going to take advantage of the open space by doing flips and cart-wheels. 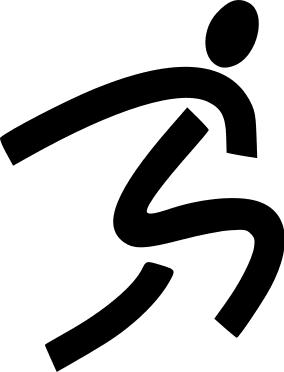 A traceur running in the woods will glide over the terrain like wind through the trees. A freerunner is definitely going to run up the base of a truck and do a flip to impress his girlfriend. And when a traceur is on a roof coming to the edge, he will quickly scale down the fire escape or jump onto a passing truck. And when a freerunner comes to that same edge, he will stop, turn around, take a few breaths, and then launch his body with beautiful twists and turns before landing on the ground and breaking both of his ankles. Freerunning for me is my parkour evolution. I can’t say anymore that I do parkour. Because if I want to be free to do flips or let’s say I’m learning break dancing and I would like to incorporate it into my parkour expression… or let’s say a pizzeria is nearby and I’m hungry. You know what. I’m going to order a slice to go. I love the fact that Daniel Craig in Casino Royale found no shame chasing after Foucan in a construction vehicle. Being British, Craig may not be the most gifted acrobatically and would have little want to practice the art of parkour or freerunning. I do believe, though, he would make an excellent mudder.